This could be the plot of a “Mr. Magoo” cartoon. Two years ago, Wang Kaiyu, who lives in China’s Yunnan province, bought what he thought were two black puppies. “When I was working on my banana farm, a Vietnamese man came up and showed me two good-looking pups,” Kaiyu told the Want China Times. Wang took very good care of his new pets, bathing and brushing them every day. He was rather surprised by their voracious appetites, and how they would eat his pet chickens. “Some people had offered to buy them for a lot of money, but I never agreed,” Wang told the Times. Instead, the dog — er, bear — dad did the right thing. He contacted the forestry police. On June 30, the male and female bears were taken to the Wildlife Rescue and Rehabilitation Center of Yunnan. “I love them so much,” Wang said. 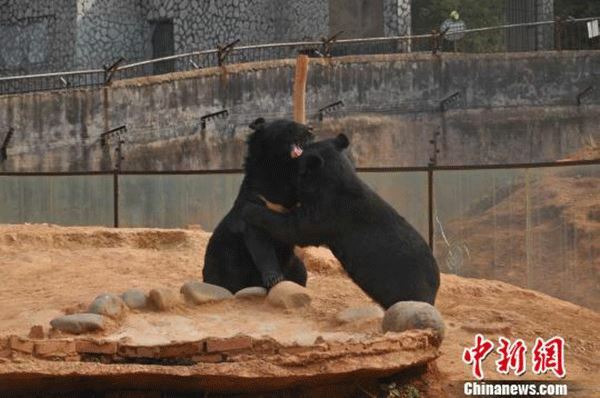 Feng Lingui, a rescue center spokesman, told the People’s Daily Online the Asian black bears are about 3 years old and in good health. He said the center is working on finding permanent living arrangements for the pair. Due to deforestation, being hunted for their body parts, and being subjected to illegal bear-baiting exhibitions — in which, after their claws and teeth are removed, they’re forced to fight dogs — Asian black bears are classified as “vulnerable” by the International Union for Conservation of Nature and Natural Resources. They cannot be kept as pets.